Ballarat Swap Meet is the largest of its kind in the southern hemisphere. 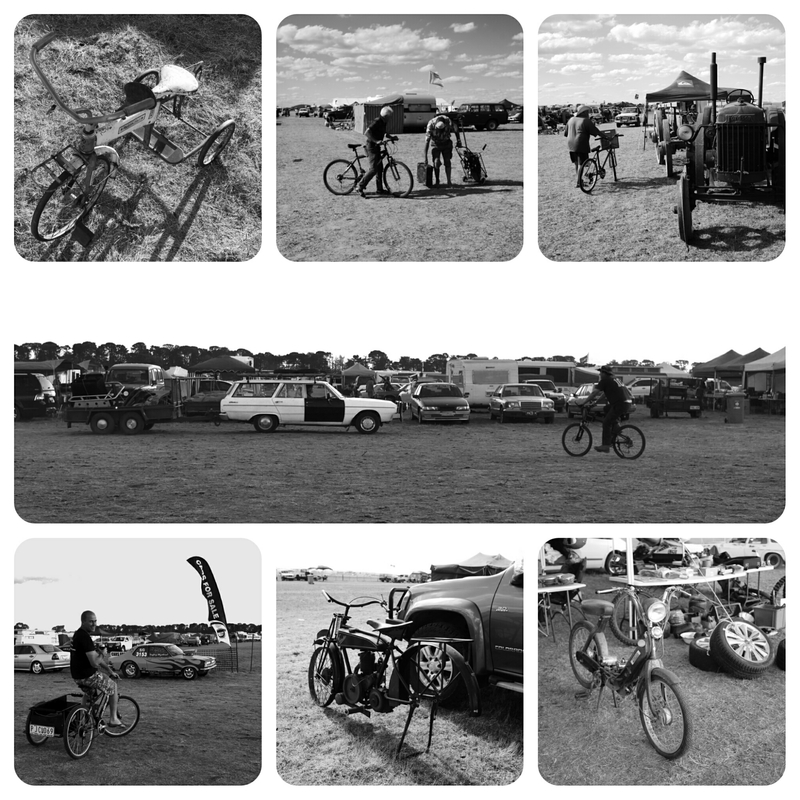 After getting around the vast grounds on foot, pedalling around on bike is the second most popular method. Followed by every other kind of non-motorised conveyance you can think of! 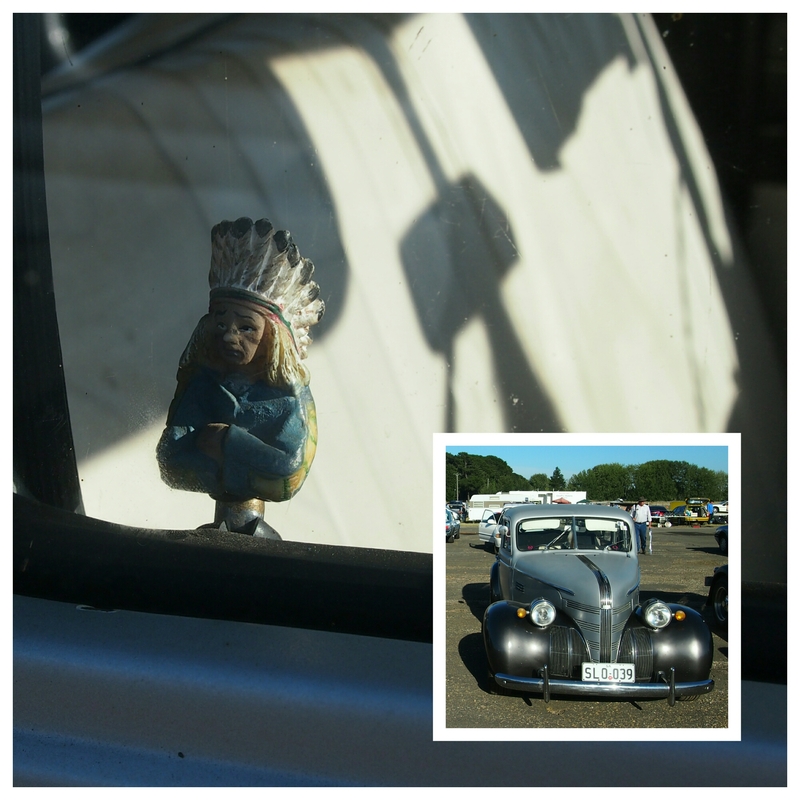 As I leant in to see the dashboard of this lovingly restored Pontiac, I noticed the door lock pull chief glowering at me! If you’d asked me this morning if I’ve had an awesome time at the swap meet, I’d have grizzled about the infernal weather – too much sun for photography, too much heat for me. But tonight, wandering around with my bestie and my Olympus XZ-2, through the remains of the day with only an eighth of the site holders remaining, I felt refreshed by the cooler change in the weather, the improved lighting situation pre-sunset, and the amazing sights revealed once a few distracting elements had removed themselves. Arriving back at the caravan on dark, my camera battery exhausted, we sat down to reflect, and enjoy the neighbours’ mellow ’50s music. 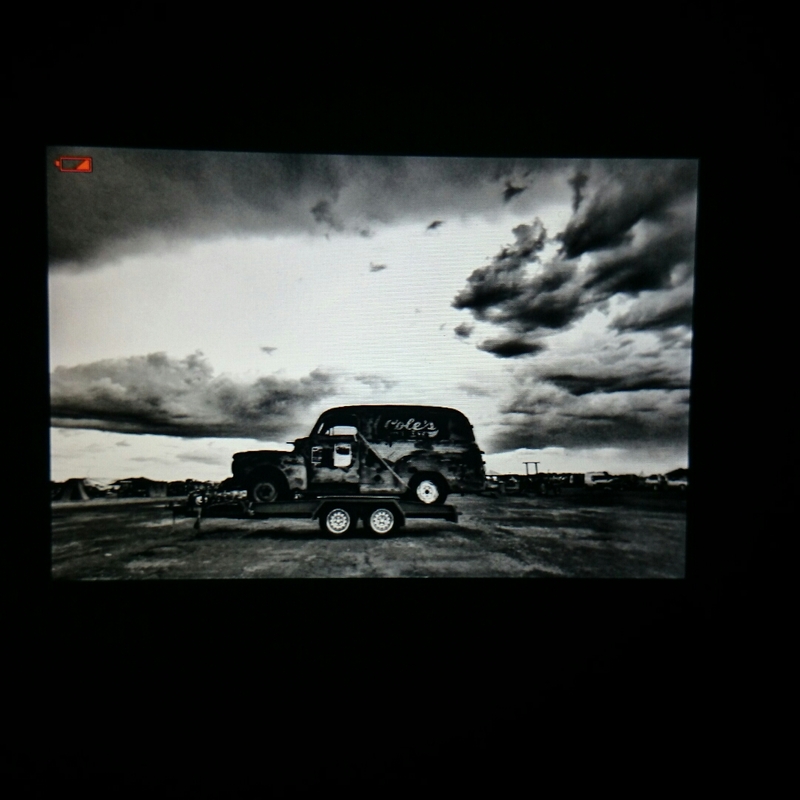 This photo is of the screen, and last photo taken on, my camera. Now I can’t wait to get home and start editing – and sharing photos with you. 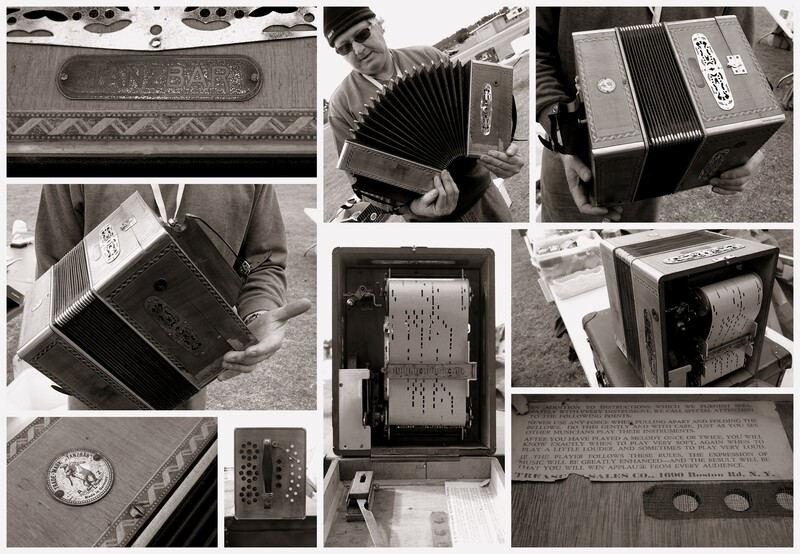 The sounds of a vintage button accordion being played nearby intrigued me into making a visit to an antiques stall, where I met Janell and Dave – it was Dave who was playing the odd tune throughout the day. Later on, he brought out this curiosity to show me: a Tanzbar mechanical “player” accordion. As he played it, I noticed a quiet clanking coming from inside; not knowing what manner of magic was being performed at that point, inquired if it were “typing a letter in there”, whereupon Dave opened it up to show me what was concealed inside. Probably made in the 1920s, the accordion houses a roll, much like a pianola (or “player piano”) roll, which is advanced by opening and closing the bellows of the instrument in the usual fashion – quite without need for actual musical ability! There must have been a fascination for such instruments around that time, as I have since learned that there was a Clarola (clarinet), Rolmonica (harmonica), Triola (zither), and more. What a wonderful example of musical ingenuity. Please click image to view full size. 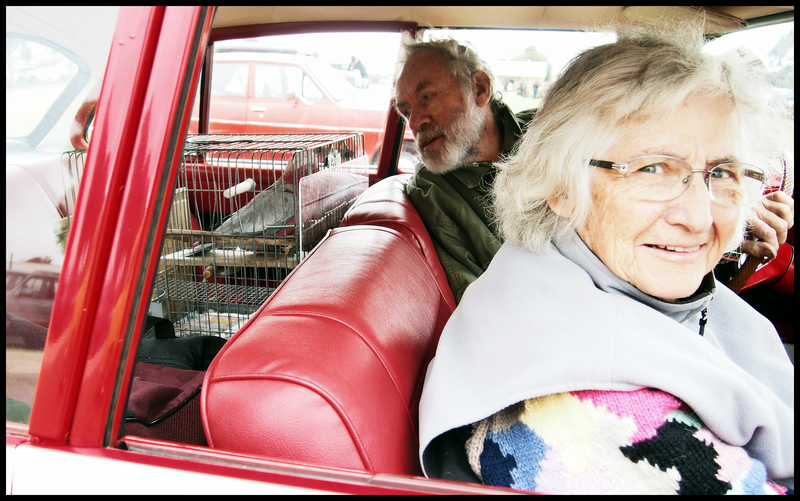 While admiring a lovely early-’60s LHD red Dodge Lancer, I spotted a lady sitting in the passenger seat knitting…and then I noticed her pet galah in a cage in the back seat! I asked the lady if she minded my taking photos of the car, and when we got chatting she told me the 15 year old galah went everywhere with them, and had quite a following along the swap meet circuit. Just as I got clicking, her husband returned to the car and started “chatting” with the galah, who is named for their car collection. Unless you’re an admirer, it’s probably not apparent from this image that this is the cockpit of an Aston Martin DBS. With its sleek red coachwork and understated details, it was a bit of a scene-stealer at the 2014 Naracoorte Swap Meet. Completely by chance I got chatting with the owner, who – it turns out – isn’t much of a car enthusiast, but collects David Brown tractors and stationary engines. The reason for his acquisition of the V8 DBS (of which the “DB” stands for David Brown) was because of the connection: in 1948 Brown acquired Aston Martin (and then Lagonda in the following year). This vehicle was built in 1969 for release in 1970, and is the model featured in the Bond film On Her Majesty’s Secret Service. The owner admitted he seldom drives it, and can’t bear to miss a swap meet. It’s amazing, the stories you hear. I had tried to create greater coverage with my body to prevent capturing the reflection of the neighbouring Mercedes Benz, but in the end I really liked how this turned out.